When studying history, we ask questions of the past, seeking to understand what happened in the lives of the people who have gone before us, and why. 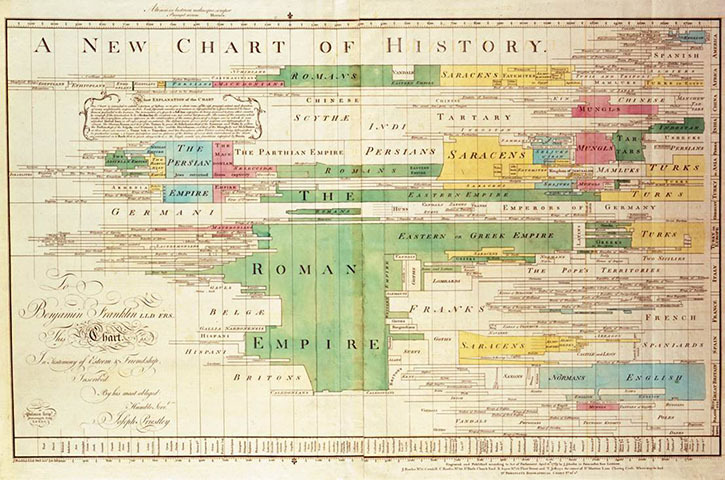 A data visualization of history suggests and answers a thousand questions. Sometimes, the value in a chart or graph of history is that it proposes new questions to ask of the past, questions that we wouldn’t have thought to ask unless the information were presented to us in a visual way. Take the history of the United States presidency. Every high school student in the U.S. learns the names of a growing list of former presidents. They learn about the founding fathers, and the various wars and movements that occurred over the course of time. They memorize the names and dates, at least until the exam is over. Wikipedia provides a lot of information about U.S. presidents in table form. A whole host of observations can be made by looking at how the bars line up and overlap with each other. One remarkable (or fantastical, as some would say) aspect of the Old Testament is that prior to the account of the flood, the characters in the pages of Genesis are purported to have lived hundreds and hundreds of years – over 900 in fact. According to the Biblical account, these patriarchs lived the vast majority of their lifetimes after having children. After the flood, the lifespans of successive generations of people in the lineage of Noah get shorter and shorter. 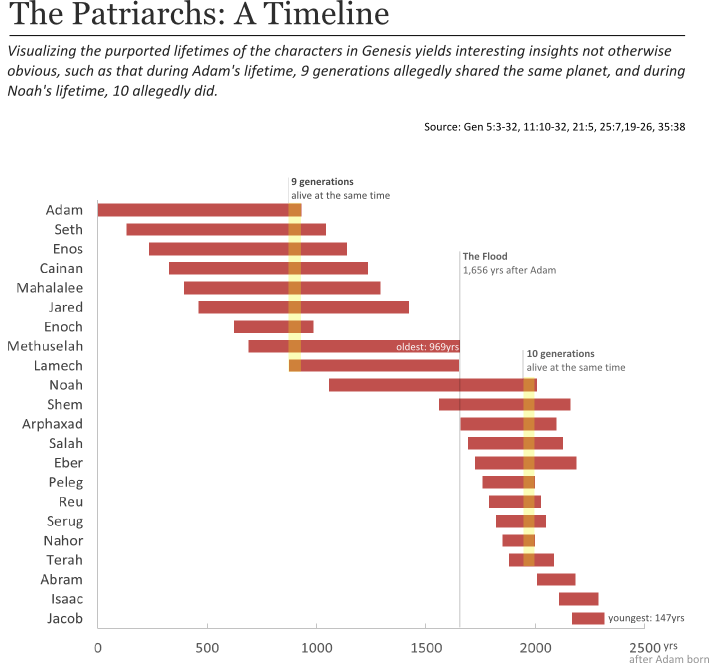 It’s pretty simple: visualizing history using a gantt bar chart is a useful way to spot overlap in time – overlap of people with events, people with key dates, and people with other people. It’s also a useful way to spot patterns and identify impossibilities in a list of dates. This is great! I LOVE Gantt bar charts. They’re one of my favourite views. I’ve created many for project management teams to manage their project portfolios. Seems to be very effective. We also use them to keep track of upcoming audit check points in our IT environment. Hey Paul! Thanks for the comment, and glad to hear there’s another Gantt fan out there. Very interesting and well executed! You actually inspired me to have a go myself at creating a similar chart for Sweden. As we don’t have presidents, I had to make do with our Prime Ministers. I didn’t have much experience with Gantt charts before this, but I really learned a lot. Very cool, thanks for sharing your version Martin, and glad the exercise helped you learn. I like how you added the images to your version. It adds a whole new dimension. Terrific post, Ben! Really engaging visualizations and a very clever and clean application of Gantt Charts. The Patriarchs viz was enlightening for me (no pun intended), and the Presidential viz really encourages study and exploration. On the Prez viz, I especially liked the inclusion of the historical periods and the potent, limited use of color. Really a great looking, tight viz. Congrats! I can’t wait to steal . . .er. . appropriate your methodology for some vizzes I’m working on! Thanks for taking the time to seek into the biblical accounts. Sincerely, the Gantt’s charts are something that I dreamed to see, maybe, construct them. Inspired me to build the King’s lifespans Viz. Hi Holanda – very cool, I’m glad this project was inspiring for you. Be sure to leave a link in the comment thread when you finish your viz. Hi Ben, just want to thank you for the amazing work and unique thoughts! I found this site via your dashboard template on chandoo.org and liked it immediately! Really like the way you visualize data. Thanks a lot Samantha! I appreciate it.